If anything this single is more intense than Hal Tiore’s on the same label. 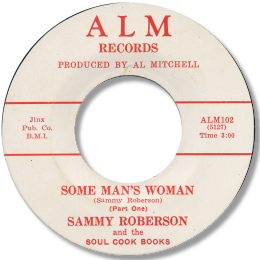 Roberson simply screams and roars out his pain over a similarly low-fi production and sympathetic playing from the interestingly named Soul Cook Books. There are the occasional chord changes on the hook and horn flourishes to retain interest but this is really a primitive minor keyed drone piece. It’s all about the voice – and Sammy doesn’t disappoint at all. Part 2 continues his agony. One to treasure. UPDATE ~ Sammy's first 45 may well have been "Just A Matter Of Time" and his version of the Clyde Otis evergreen isn't at all bad. The RIK issue comes from New York but the earlier Pastel 45 comes from Fort Worth, TX - was this his home town? NEW UPDATE ~ I'm grateful to Alan Wheway for the update to the discography.